Do you think the thing you sell is too boring to write great copy for? Copy that sings? Copy that makes your readers want to pull the trigger on the “Buy Now” button? There’s a way to make almost anything more enticing, compelling, and gotta-have-it-awesome through the use of compelling copy. And I’m going to prove this to you by way of an example. These crystal clear shot glasses add style and glamour to your entertaining. The glasses have a sturdy feel and modern design, making them an easy match to your barware. Dishwasher safe. Set of six. The classic shape and subtle elegance of these sturdy glasses will be perfect for all occasions. The understated design will coordinate beautifully with any table setting. Each shot glass has a 2-ounce capacity. Dishwasher safe. Set of 6. Ooooh, dishwasher safe, really? 2-ounce capacity? Sturdy? You don’t say! Now, if you’re shopping online for shot glasses and just want something sturdy and utilitarian (because lord knows, your shot glasses should be “sturdy” above all else), this may be all the persuasion you need to get out the credit card and place your order. After all, it’s an inexpensive thing that doesn’t require lots of convincing to get one to click the “Buy Now” button. But, what if, in tooling around the interwebz looking for the perfect shot glass, you came across this copy instead? Would you like to swing on a star? Carry moonshine home in a jar? 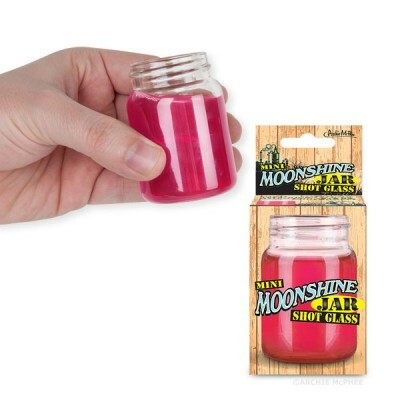 If you’re a practicing hillbilly, the Mini Moonshine Jar Shot Glass could save your life. After you eat your vittles and get up some gumption, there’s nothing better than moseying out to your still and filling a big ol’ mason jar full of liquid lighting. However, as every health conscious hillbillly knows, a jar is a huge serving and when you’re drinking moonshine the word is “moderation.” This tiny glass jar is 2-3/4″ tall and holds 2 oz. of the hooch of your choice. See, we’re all about healthy hillbillies. Approved by the Hipster/Hobo Alliance. That, my friend, is from the hilarious and wonderful Archie McPhee website. Sure, they sell goofy novelty items, but their copy is brilliantly written, and you could do worse than studying how they create desire for their products through the use of dazzling copy. So here we have product descriptions for a simple, run-of-the-mill 2 oz. shot glass. A very simple, and even boring, product. Which one seems cooler, hipper, more gotta-have-it interesting? Hands down, it’s the Mini Moonshine Jar Shot Glass. What you’re seeing in action here is marketing genius – the ability to invest something utilitarian, plain and boring with real, live sparking personality. And that’s the kind of copy that gets remembered, and more importantly, sells. What makes this copy work? It’s funny. Now funny doesn’t always work, but for this product it does, and for Archie Mcphee as a company it does, because their whole company persona is irreverent and F-U-N, fun. It shows personality – this is key. This is the Archie Mcphee “voice.” Even if you didn’t know where the copy came from but were familiar with the company, you’d likely be able to pick it out of a police line-up as Archie McPhee copy. It’s unexpected. “If you’re a practicing hillbilly” is not something you expect to see in a product description, is it? And it sets the tone right away for the rest of the description. Notice how they “paint a picture” with copy: “After you eat your vittles and get up some gumption, there’s nothing better than moseying out to your still and filling a big ol’ mason jar full of liquid lighting.” You can just see a dude (or dudette) with overhalls “moseying” out to the still to get a refreshing dose of moonshine, now can’t you? It’s so damn entertaining you can’t help but keep reading. And because of that, it’s memorable. And memorable is good. In the copy examples above, which one would you remember at the end of the day? Which one would you still be smiling about? Which one would you be more interesting in owning? So, personality – if you can add it to your product descriptions, sales pages, web copy, emails, social media status updates, and all the other content you write for your business or your passion project, you will be ahead of the “boring and forgettable” game, engage more of your ideal audience, and generate more interest in your offerings. the next time I write a sales page. Thanks for the tips. I like these examples 🙂 I agree, that engaging copy can make all the difference. I recently bought an arsenal of Mrs. Meyer’s Clean Day products. The copy convinced me that it was something that would be immensely useful, different, and good for me (and particularly for the type of house I live in). Not to mention the light, colorful product branding that they offer. Their website is engaging…I ended up buying it immediately after researching on the website. It was the best example I’ve seen in a long time. I’m afraid I would have to disagree. The marketing for the hillbilly shot glasses would not sell them to me at all. I got as far as vittles and stopped reading. They’re definitely marketing to specific demographic, which doesn’t include me. When I’m shopping online, I don’t want to be entertained or read a bunch of narrative that has nothing to do with me or the product. I want the information given to me simply without a lot of fluff I don’t need so I can quickly find out if it’s something I want. Tell me how it will MY life easier and better, not how it will make a respectable hillbilly’s life easier. Marketing to your demographic will go much further than just assuming funny copy will sell your product to anyone. I think the point here is that these shot glasses would appeal to the demo they’re meant for and that that demo would respond well to this copy much better than they would to some boring, awful, lackluster copy, which is an affliction of product copy all over the web! : ) Of course, it’s not for everyone. And actually, in many cases, great copy will turn off the people the product is not meant for. So this copy is a great example of marketing to a very specific demographic. Thanks for weighing in, Loribeth, I appreciate it!